Charleston Voice: About That Public Land In Nevada: Could it be that Nevada is not really a state afterall? About That Public Land In Nevada: Could it be that Nevada is not really a state afterall? Very worthwhile read by Al Benson, Jr. The day after I posted my last article on the situation at the Bundy Ranch in Nevada, a man in North Carolina sent me a link to a legal case, U.S. v. Gardner, NO. CV-N-95-328-DWH. which was posted on http://www.leagle.com dealing with a case similar to that of the Bundy family. It contained some interesting information and I’d like to quote a couple things: “On March 21, 1864, the United States Congress enacted the Nevada Statehood statute which authorized the residents of Nevada Territory to elect representatives to a convention for the purpose of having Nevada join the Union.” Among the provisions of the Statehood Act of March 21, 1864, this act granted “certain tracts of United States public lands to the State when it entered the Union…In addition, the Nevada Statehood statute required the convention to adopt an ordinance decreeing and declaring that the inhabitants of the Territory of Nevada ‘forever disclaim all right and title to the unappropriated public lands lying within said territory…The Nevada Constitution provides that this ordinance shall be irrevocable, without the consent of the United States and the people of the State of Nevada’.” There’s more, but we could get bogged down in all the legal jargon and that’s sure not my long suit. What it boils down to is that the folks in Nevada supposedly disclaimed any title to “unappropriated public lands lying within said territory…”In other words, the feds, way back in 1864, got to keep most of the land in Nevada and the people of that “state” promised not to contest that sticky little fact. Sounds like a bum deal, doesn’t it? It was (and still is). We have to bear in mind why the big push for Nevada to become a state in 1864. The rule used to be that, for a territory to become a state, it had to have a population of 60,000. Nevada had something like 40,000, but Nevada was pushed ahead of other candidates for statehood. If you’re like me, with a suspicious mind, you might be tempted to wonder why. The site http://www.onlinenevada.org in an article on the 29th of October, 2009, observed: “As the 1864 presidential election approached there were certain perceived advantages in having an additional Republican state. 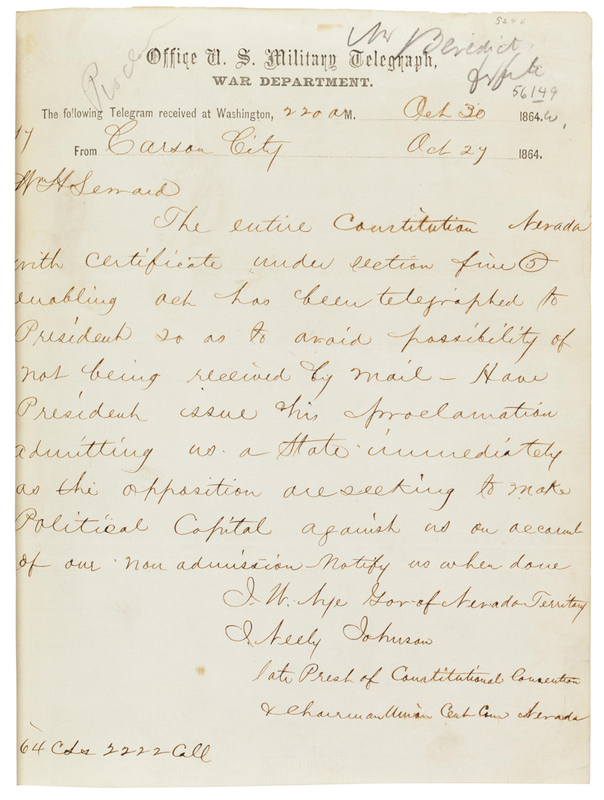 For one thing, a Republican congressional delegation could provide additional votes for the passage of the Thirteenth Amendment to abolish slavery, which earlier had narrowly failed to garner the necessary two thirds support of both houses of Congress. More overriding, however, at least in the spring of 1864 was the real fear that there might be three major candidates running for President that year, and that no party could achieve a majority of electoral votes. Then, as required by the United States Constitution, the election would go into the House of Representatives, where each state would have only one vote and where a Republican Nevada would have voting rights equal to those of populous New York or Pennsylvania.” To put it bluntly, getting statehood for Nevada was a political move to help Lincoln win the election. Interestingly enough, http://www.nevadaweb.com states that “Nevada Territory was a federal territory, a part of the Union, and President Abraham Lincoln appointed Governor James Warren Nye, a former Police Commissioner in New York City, to ensure that it stayed that way. Governor Nye put down any demonstration in support of the Confederacy, and there were some.” So they weren’t all Yankee/Marxists in Nevada. You can see by reading some of this, that the current land problems in Nevada go all the way back to the Lincoln administration. For those that follow history, at least accurate history, are you really surprised? 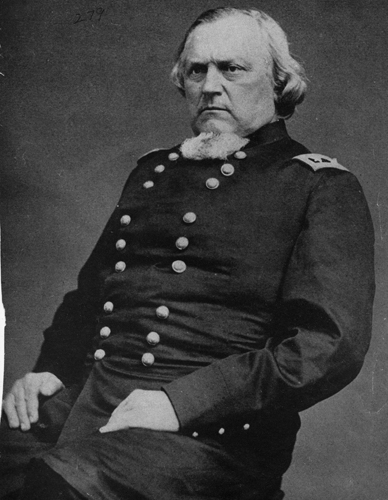 I’ve said, over the years, that many of the problems we still deal with today are a result of the Lincoln administration and its War of Northern Aggression. The current situation in Nevada is a prime example. I recently read a very good article by Steve Miller on http://www.zianet.com entitled Nevada: The Permanent Colony which dealt with the Sagebrush Rebellion I mentioned in my last article. Mr. Miller made several observations worth noting. If you can find this article on the Internet I’d recommend reading it. Mr. Miller noted that Nevada Territory had too few people to meet requirements for statehood. This made no difference whatever. Union and pro-Lincoln activists set up constitutional conventions anyway to try to get Nevada into the Union in 1863. That attempt failed, so they came back again in 1864–so typical of the socialist agenda–if you lose, keep coming back and back until you wear down the opposition. At this point, I’d ask–if they didn’t have enough population to qualify, are they really, technically a state? They weren’t admitted under the required conditions. And now comes the bombshell! According to Steve Miller: “As part of the enabling legislation, Congress imposed conditions on the state that the Supreme Court, 19 years before, had already declared illegal, citing the U.S. Constitution’s guarantee that new states should have ‘equal footing’ with the original thirteen. Under Nevada’s 1864 enabling act conditions, the people of the territory had to ‘forever disclaim all right and title to the unappropriated public lands lying within said Territory,’ and turn them over to the federal government.” A great deal–but for who? Certainly not the people of Nevada. I submit, this is something to think about in the case of Nevada and all the many public acres the federal government controls there whereby they are setting out to deny the inhabitants of Nevada the use of public land–which the feds shouldn’t even control. Does what has gone on in Nevada and other Western states sound a little like a federal land grab? If all the states agreed to abide by this 1845 Supreme Court decision, you would hardly need something like the BLM there to harass citizens. This is an aspect of this situation that ought to be considered by someone with legal training. Mr. Bundy may well have a point when he refuses to recognize federal control over much of his state. And remember, this problem goes back to Lincoln and his Marxist hoard. Something to think about.